As someone who has struggled with body image pretty much their entire life, I decided it was time to put energy into making positive changes this year. After literally locking myself away inside last year, or if I was outside, I would basically wear winter clothes in the middle of hot Nebraska summers, I knew I needed to change my view of myself. I hated my body so much I could barely stand to put on a pair of athletic shorts. I was afraid of judgment from others, but more than anything, I was afraid of looking in the mirror and seeing someone I didn’t like or recognize. It was time for a shift. If you’ve had similar struggles, here are four things you can start practicing to up your body positivity every day. Whenever I look in the mirror, my first instinct is to pick myself apart and find something to criticize. 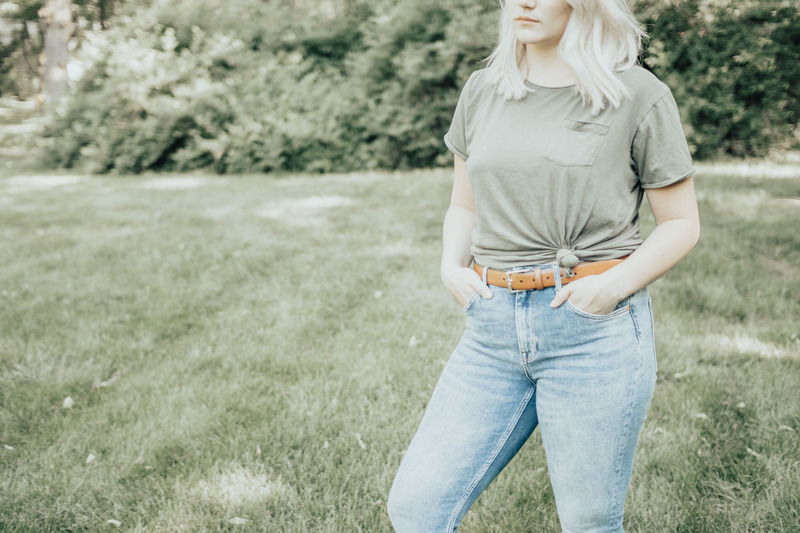 Which is why over on my blog, The Basics, I did a body positivity challenge where I challenged myself and my readers to look themselves in the mirror every day and give themselves a compliment for one month. If you struggle with self-confidence and loving yourself, you know this is much, much easier said than done, but it was so worth it. In the last year or so, I have met so many women who make me feel strong and encourage me to love myself. I honestly can’t believe the difference I’ve felt after surrounding myself with positive women who genuinely want to support me. Following these kinds of people on social media has also been a huge piece of this and I highly recommend giving who you follow some thought. A big part of my journey has been changing the way I take care of myself. Of course, for me, this will always be a work in progress, but adding in workouts and eating more of a plant-based diet has helped me feel better than I have in a long time. Knowing I’m taking these steps has played a huge role in having a more positive view of my body. This summer I bought myself a pair of cut off jean shorts. This may seem like any old thing to some, but it’s pretty much the first pair of jean shorts I’ve ever owned and actually worn. This is way (big emphasis on way) outside my comfort zone, but I wore them out with friends one night and didn’t even stop once to think about how I might look or if others were judging my body. Sometimes stepping outside that comfort zone is ultimately the best way to grow. I hope if you’ve ever struggled with body positivity, these tips truly help to make a difference in how you view yourself. I’d love to hear any other tips or insights from you guys on the topic as well! Why Does Every Guy Have to be “The One”? Love everything you said here so much. One more tip that helps is just getting distracted. Meaning finding things that have absolutely nothing to do with how you look but that make you feel happy. Going for a bike ride, playing an instrument, writing, drawing, reading. You sort of realize that you have so much more to offer than just the way your body looks. I like those tips because one of them is focused on health. This is so ften missing from body positivity guides or tips as well as from body transformation stories. I believe health is the most important thing and being grateful to your body for doing amazing things every day that we take for granted. What really helped me was to realise and remember how strong and beautiful my body is and how it survived all the terrible things I have put it through over the years without failing me.